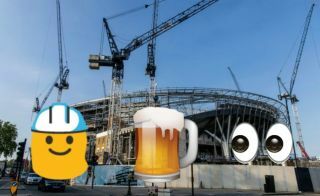 An incredible report on the absolute farce that is the building of Tottenham’s new stadium has emerged with some remarkable stories about what’s been going on behind the scenes. As well as a general lack of competence and organisation from those involved, some major allegations of drinking and drug usage by the builders on site have been made by Construction News. This will all make grim reading for Spurs fans, who’ve waited a long time to move into their new state-of-the-art home, as their north London rivals Arsenal managed to do back in 2006 with comparatively minimal fuss. This project, however, has continued to stall and Tottenham remain at Wembley Stadium for the time being, but it’s the nature of the delays that is perhaps the most damning of all. Construction News make it sound like absolute madness down there at the site, saying drugs and alcohol have been used by workers there, including some taking cocaine in the toilets. The report also claims fighting has broken out at times, with people involved ‘off their heads’. There is also talk of builders not being given the proper tools to do the jobs required of them, as well as tools and materials arriving late. Tottenham fans will just want this embarrassment to be over as soon as possible.